Minister within the Ministry of Education Nicolette Henry today apologised for any inconvenience or distress caused by the incident where the opposition PPP/C walked out of the jubilee flag-raising event on Wednesday night because seats could not be found. The PPP/C this afternoon responded to Henry. 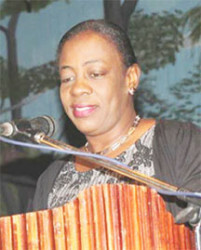 In her statement, Henry said the PPP/C delegation arrived later than had been agreed and used the incorrect entrance. She said that by the time other invited persons had been asked to give up their seats to ensure that the opposition members were seated, the PPP/C members had walked out. There was no specific apology by Henry to the PPP/C over the incident. Seating Arrangements – Opposition Leader will be seated in Presidential Section with all other past Presidents and Prime Ministers. All other PPP members will be seated in the other VIP section. Response – No keynote speakers, the announcement for National awards will be done by Col. Abraham. Where will the Opposition Leader be seated? Response – In the Presidential Section. How many persons could be admitted with a ticket? Response – Maximum of two. Opposition Leader could not find his invitation. Response – The Opposition Leader will be admitted without his invitation. All protocols and courtesies befitting his office will be extended. What Happened on the night of May 25. Had it not been for the police insistence on using the North Western entrance this would have resulted in the Opposition and President arriving on the tarmac at the same time? c. Upon my arriving in the Presidential Section the Opposition Leader indicated they were concerns with the seating. I assured him I will address this immediately, so I proceeded by personally asking other invited persons to give up their seats to ensure the Opposition members were all seated together. As soon as the persons began to give up their seats. The Opposition walked out. In the circumstances I wish to state that as the organizer of this event I apologize for any inconvenience, embarrassment or distress this incident may have caused. A statement by the PPP/C follows:The PPP C Parliamentary Opposition has noted with some amusement the press release issued by Minister Henry this morning, May 27th, 2016. Clearly the statement is a poor effort to extricate the government for the disrespectful treatment of the parliamentary opposition at the 50th Independence Anniversary Flag raising ceremony. The Minister clearly seems to have difficulty comprehending the issue at hand. The Minister gave all assurances on May 24th to the Leader of the Opposition and a large group of PPP/C MPs and again on May 25th with the Chief Whip that seats for all PPP/C MPs and their spouses were reserved for the flag raising in the VIP section and that “we should not worry everything was taken care of”. The Minister was advised that the PPP/C MPs were coming as one in a bus to reduce any problems. The invitation stated that everyone should be seated at 9:45 p.m. Despite difficulties getting into that section of the park the delegation arrived at 9:45 p.m. In the VIP section. The Minister’s statement refers to irrelevancies with regards to which entrance, time, etc..
On arrival the VIP section was full. No seats were reserved for the parliamentary opposition nor did it appear that there was any such reservations for any other VIP dignitories. The former Presidents were to be seated in the VVIP and this was done. So too were MPs Anil Nandlall, Bishop Edghill and Clement Rohee. Minister Henry’s statement lacks any appreciation that there was a breach of protocol in the seating of the opposition MPs in the VIP section,and that this was humiliating and disrespectful and further that she reneged on her public assurances on May 24 given to the Leader of the Opposition and PPP/C MPs that our seats were reserved. However. Minister has to be reminded about her press conference on May 24th where she said the VIP would be on” a first come first served business”. When asked, she said the press had it wrong. The media has said that their recordings show otherwise. Maybe the Minister was being prophetic in that she knew that more invitations were distributed than seats were available yet she took no precautions to ensure her assurances were upheld.. Unfortunately an unequivocal apology by the government was in order. Sadly this statement missed the mark.